Discussion in 'Star Wars Costumes and Props' started by DrscifiProps, Jun 28, 2016. Building a 1:1 K-2SO puppet. Working on K-2.0 upgrades now. Hello, my name is Darren, aka Dr. Sci-Fi. I’ve been a fan of Star Wars and Science Fiction my entire life. I’ve also enjoyed building my fandom with props, armor, and suits. 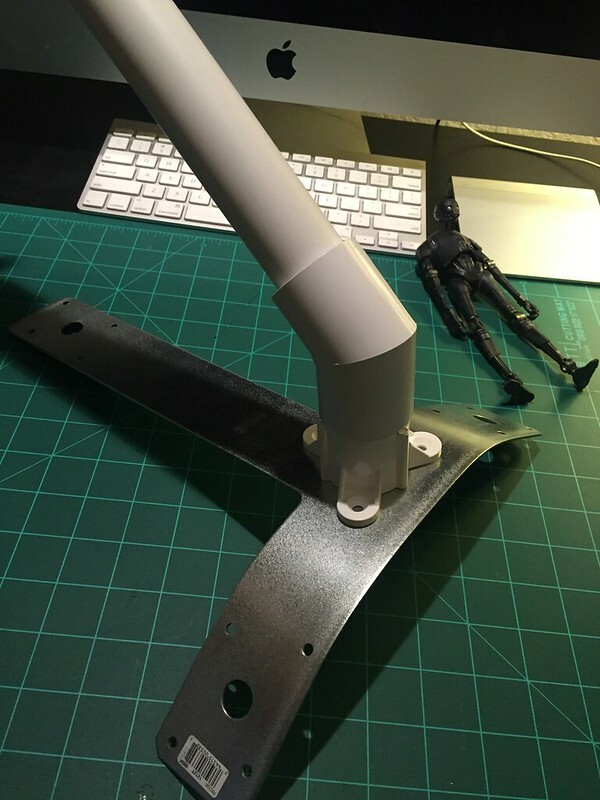 I am building a 1:1 scale K-2SO Puppet. He began his life as a suit build which you can read about below but now is progressing as a puppet I will operate connected to my hands, feet and chest. I'll be keeping this first post updated with the latest content but enjoy my build blog and progress. vader45, Martini Racing, Ford W Maverick and 11 others like this. Well you're off to a great start. Subscribed! It will be itresting bulid for sure. I'm wonder how compromise beetwen acuracy and making it actual costiume will work out. Shifting plans from a suit to a puppet. More posts below. Now I am about to tackle my most ambitious project yet. A K-2SO droid from Rogue One: A Star Wars Story. I hope to catalog my build process here on the RPF and welcome your encouragement and support. My time table is to be done by the premieres in mid December. 170 days from this posting. I first had this idea a few months ago, and am now in the R&D phase. Gathering information, costs, parts, materials, fabrication methods. There is a lot to do and very little to go on so far. So an upfront warning, I will be posting pictures here I find from the internet as I source K2’s look. I don’t want to spoil the movie for myself but I ultimately need the info on this droid. So if you don’t want to see any images from Rouge One turn back now until after December 2016. K2’s original design was a spin off from another project I had in R&D, an IG-88 puppet. My original plans were to have a K2 puppet a foot in front of me that was attached in a similar manner to how they did C-3PO in The Phantom Menace. But as I talked to costuming friends I realized the best option would be to do a K2 suit. Which of course had it’s own enormous challenges. My ultimate goal is to take K2 to a Rouge One premier in December if I can. This guided me down the path of Plan B, a suit. I’ll be posting several shots from my K2 notebook, it’s where I sketch ideas as my mind turns this droid over and over. "Plan A vs Plan B, A puppet vs a suit"
"Mapping out the individual components for putting the suit on"
"Mock up of fitting inside suit, before full front image of K2 surfaced. K2 was 8.5' tall." 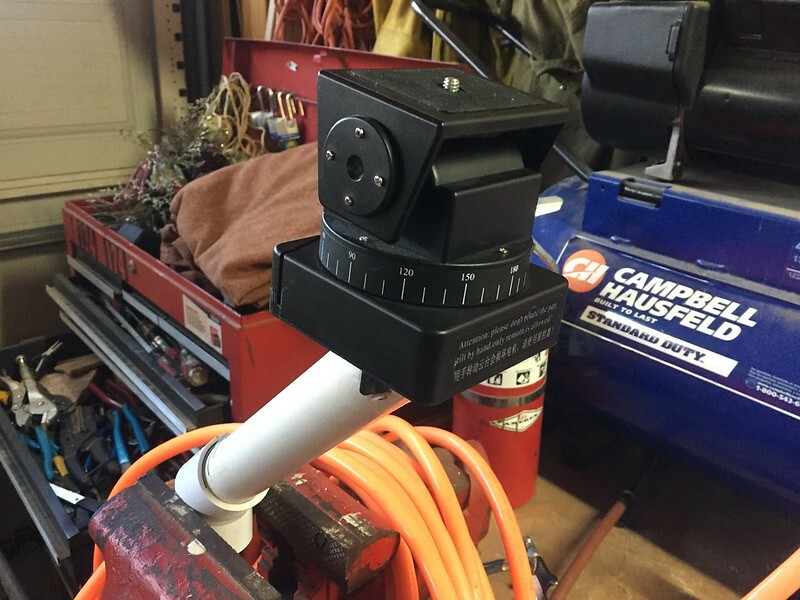 I begin setting up a modest budget of $500 dollars for parts and tools. I had just finished a GONK droid for around $250 but he needed specific parts to get the look I wanted. I may go beyond this estimate but it’s good to have limitations, they expand what you will try to make it happen. One of the trickiest parts of the build is the very limited or non existent images of K-2SO. I’m hoping for a few more trailers and images but at least have a bit to start with. I really wish I knew his approximate hight as that would help me scale him, but I’ll get into that later. That I can stand in it for long periods of time. Be safe if I fall over. From the first R1 trailer it appears that K2 is much taller than the average human. This makes the project even possible. As the real K2 never existed physically. He is a completely CG character. His legs are very very long, and his arms are elongated too. I decided to go with stilts for the legs and arm extensions for the forearms. Once Entertainment Weekly released a full frontal shot of K2 I began to envision how I would fit inside the droid. My original plan was to have my entire upper body in his torso and use a camera to see. The head would be a puppet above my own. 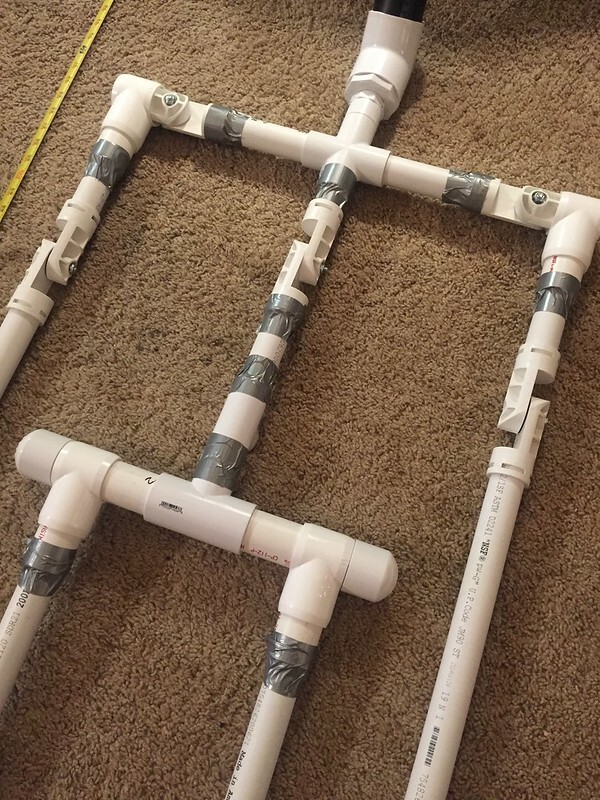 There is a 35% chance I will still go this route, but I will need to do some full size cardboard mock ups to confirm the direction I want to go in. "K2! WHY CAN'T YOU STAND NEXT TO SOMEONE FOR SCALE?!" "When you do stand next to someone i'll be ready K2!" I took a picture of myself in my Stormtrooper under armor and using my 6’ hight for scale adjusted K2’s proportions to fit around my body. I do need to fit into the thing, and I can't move my hips or where my knees are. Talking with the twitter user @KayTooEsso led me to believe his hight may be 6.75’ high. With trying to make myself fit inside him I had to make K2 around 7.5’ high to fit. And that is with my head being inside a helmet for his head. Not my first choice but again, the cardboard mockup will be my deciding factor. 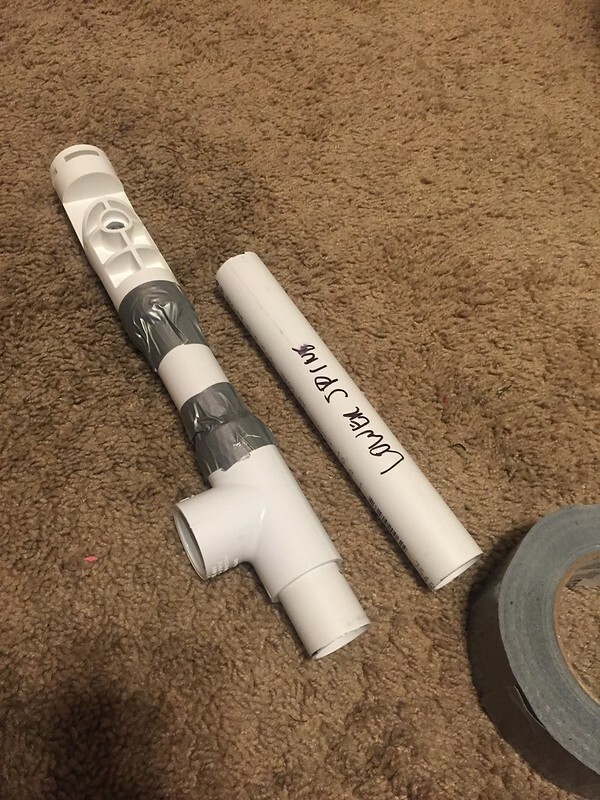 I plan to build K2 out of foam. I purchased a foamsmithing guide from Punished Props @chinbeard. This will be my first foray into foam, having worked extensively in cardboard and ABS plastic in the past. 1/3rd scale Electra 10's and Stormtrooper Armor respectively. But I’m confident I can do it. I am searching all over the internet for a pair of Marshalltown SKY2115 Skywalker stilts. They are the only ones I can find that look like a foot instead of two poles and a plate. But Marshalltown has discontinued their sale. I hope they won't eat up too much of my budget. In the recent EW images it seems K2’s eyes have a bright ring around their edges with a soft glow in the middle. Very cool. Will need to figure out how to do this with LED’s. I have yet to determine if his head will be on my head, or above it. If I do wear it like a helmet I will try to cheat my neck by having a thin ribbed tube over the front which is the proper width of his neck and then have my neck in black cloth behind that. Giving the illusion of a thinner neck. But we will see. If the head is a puppet I want to try to put my 170* back up camera in his vocabulator (mouth) to get a high view of where I am looking and walking. Inside the torso I would have my monitor from the back up camera. My arms would also go up to K2’s elbows. So my wrist joint is his elbow joint. This will work well and is the most thought out part of the build so far. I plan on using a backpack frame to support the torso/head on my person. All of these pieces will be foam for tooling and weight. 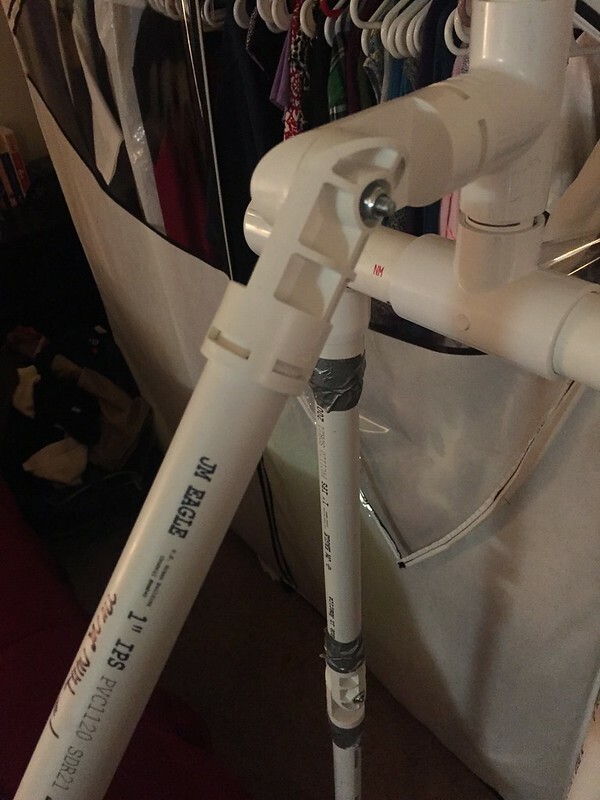 I’m thinking of a double cup method to secure the torso to my backpack frame. This would let it be automatically guided into the cups and secured with rare earth magnets. (REM) I want to be able to don as much of this suit as I can by myself. "Two (wrist) elbow ideas, going with the wrist elbow instead of the gear elbow"
I also came across a rendering of K2’s back which has a Stormtrooper feel with the cog and bars but with some cool antenna. This image alone will make it much easier to complete his torso design. If it is accurate. I plan on making a (wrist) brace for me that I can mount into his elbow. I will also run wires down the forearm to his hands so I can close his fingers with my fingers. This is a simple technique used in many puppet arms. I can cheat making a right angle with my arms by coming through the lower part of his shoulder joint. For the legs I plan on wearing the SKY2115 stilts. This number stands for the 2.1 version with a minimum 15” foot hight. 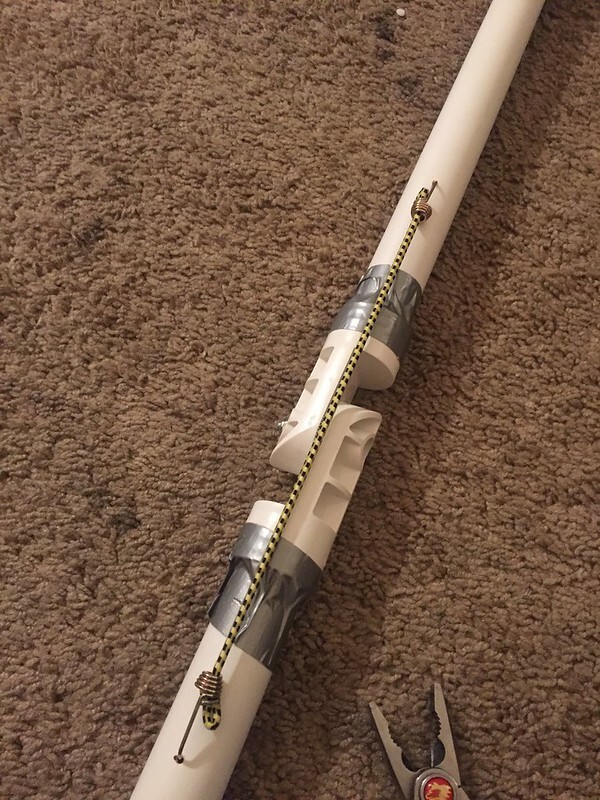 But I can extend that up to 23” if I need to. My foot will be half way down his lower leg and the stilt foot will be covered with a shell to match K2’s width and look. 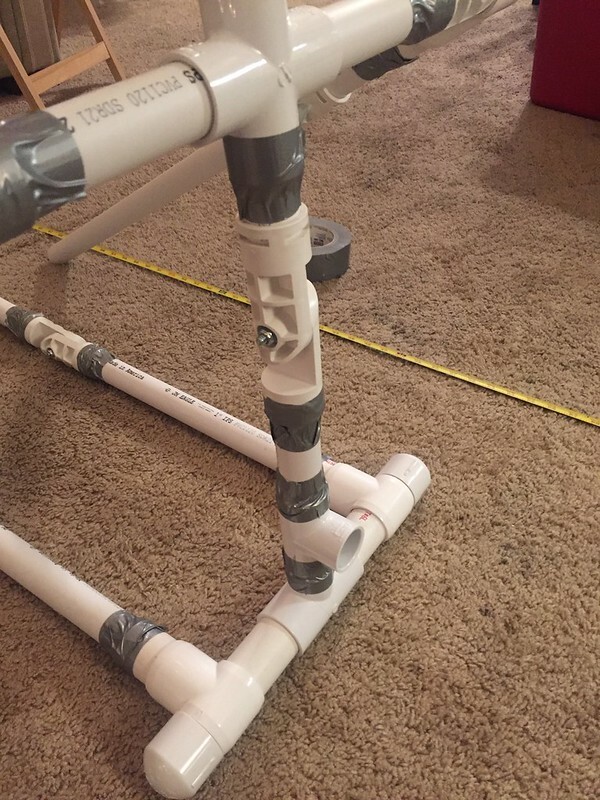 "Minimizing the look of a real foot on a stilt is a top priority. This image looks at ways to hide my toe, but now seeing K2's legs I will simply make an oval around my entire foot." 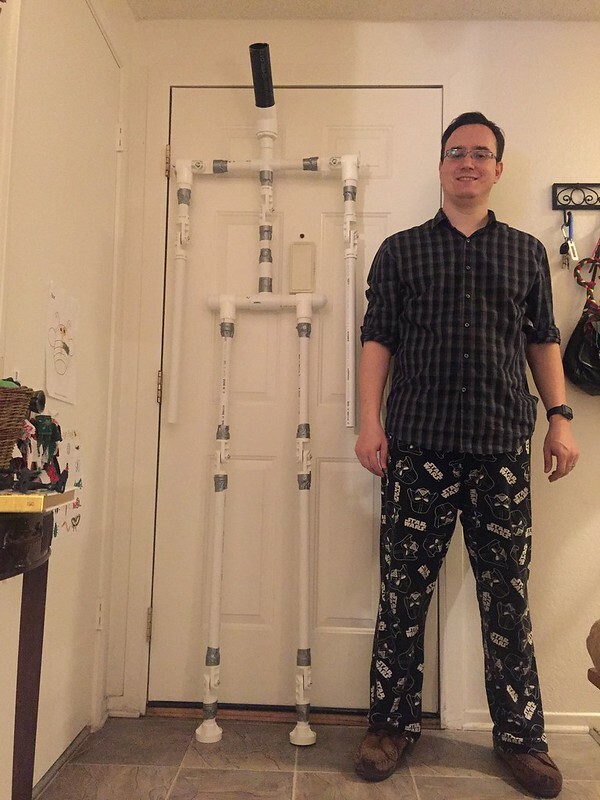 Once I have my stilts I will be practicing with them every week to be comfortable enough using them in the suit. I may also build a solid rod into the right arm so that if I begin to fall I can catch myself, probably sacrificing the hand. So for now I am continuing to look for my stilts. 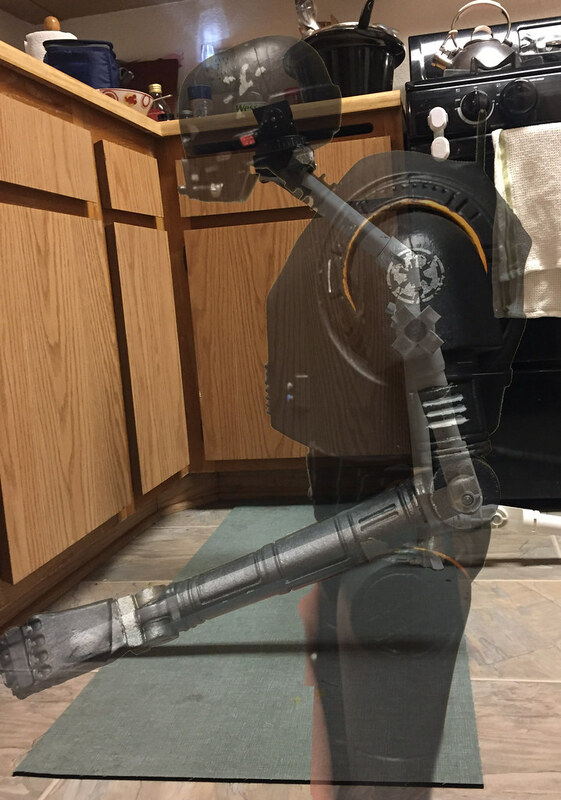 Determine K-2SO’s hight and other dimensions. Decide to use his head as a puppet or helmet. Please feel free to comment with any info you have found on K2. I’m looking forward to the next 170 days. "Posing with my friends desert GONK"
Today was a milestone. I found my STILTS!!!!!! Marshalltown Skywalker 2.1 series, which expand between18" to 30". I'm planning on having them at 2 feet (24") for K-2SO. These have been very difficult to find for something besides full cost. Should arrive by July 21st. This weekend is Star Wars Celebration Europe and I really really hope we get more of K-2SO. If anyone comes across images, specifications or merchandise please post it here on this forum for my research. Perhaps I will discover his elusive hight. 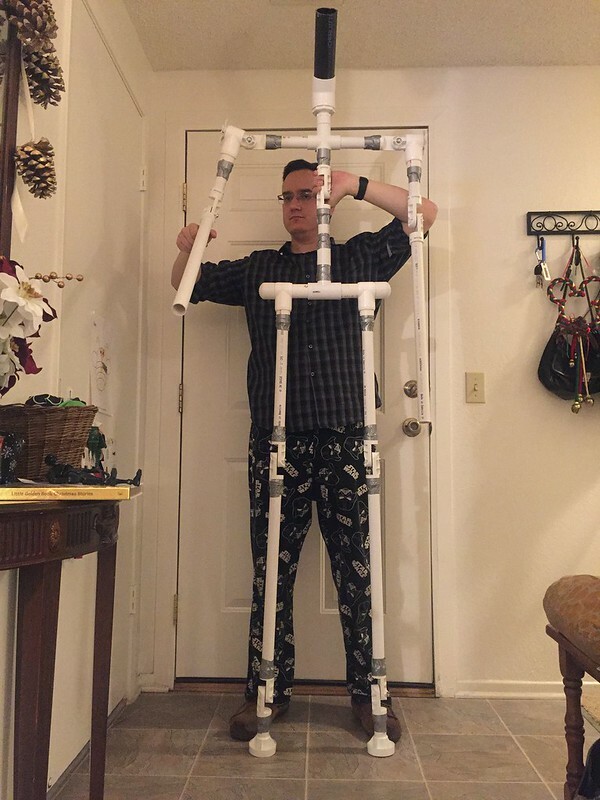 Once I have my stilts I will start practicing and constructing the legs out of cardboard for a test run. 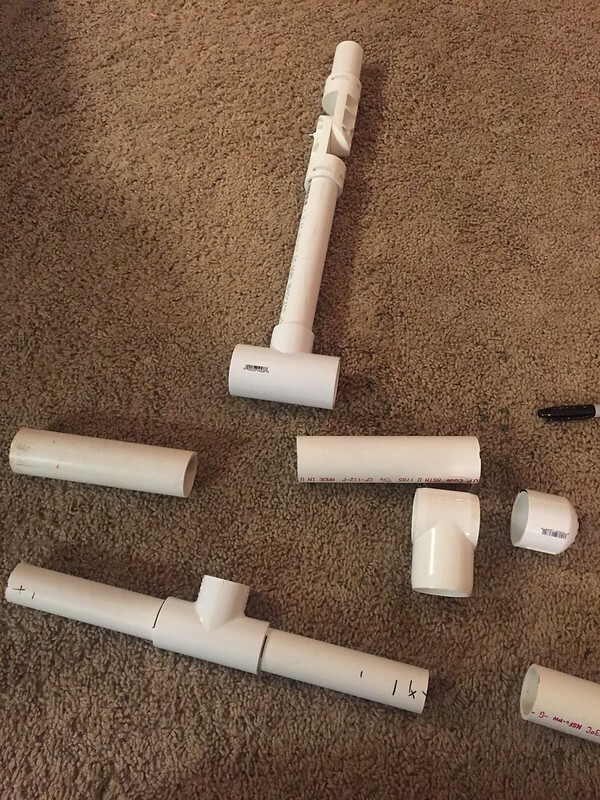 If that is successful I'll begin foam fabrication. 154 Days until Rogue One! Let's do this! Skywalker series is rather fitting for a Star Wars project! Good luck with the build! We have more pictures! This past week was Star Wars Celebration Europe in London. We got a great sizzle reel of behind the scenes Rouge One footage. But this image is what caught my attention. This is Alan Tudyk in his motion capture suit with K-2SO imposed over him. He is mostly blocked but knowing he is 6' tall and has a helmet on I estimate K2 to be between 7' and 7' 2". Alan also says that K2 is seven feet tall at the Rouge One panel. Now that statement sounds like a nice rounding of the hight so I'm fine making him a few inches over 7 feet. So with my new calculations I scaled the Entertainment Weekly image to a hight of 7' 2". I then adjusted my profile into a K2 that is 7' 7" tall. I also am moving towards building it with the puppet head instead of the helmet head. This means i'll need to scrunch my head down a little bit. Cardboard prototype will reveal which course I take. 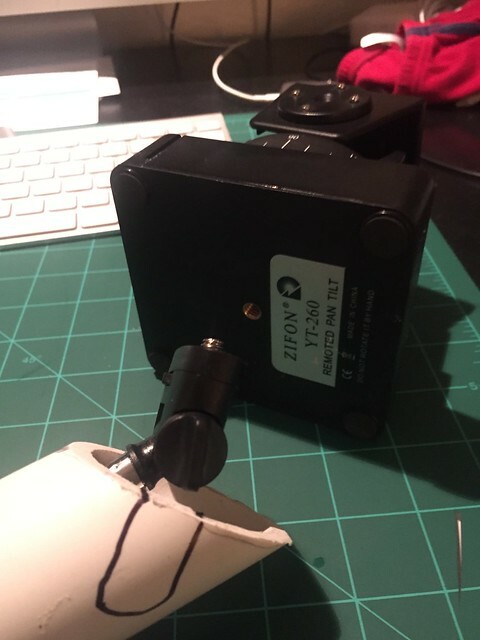 In researching K2's neck I came across the "JFOTO Zifon Remote Control Automatic Motorized Rotating Stabilizer Head Mount Pan Tilt + Wireless Remote Control" on Amazon. This will allow me to keep the small keychain remote under my right thumb. Mounted at the top of his neck in the lower part of his head I can make him look side to side and up and down. The motor movement is a tad on the slow sign but I don't know if i'll find something that satisfies all of my requirements. Battery Powered, One Handed controls, Pan and Tilt. Here is another beautiful image from Celebration. I love the weathering on the imperial logo. My Marshalltown Skywalker 2.1 stilts are here. I tried them on at their lowest hight and they work great. This adds 21" to my foot hight. 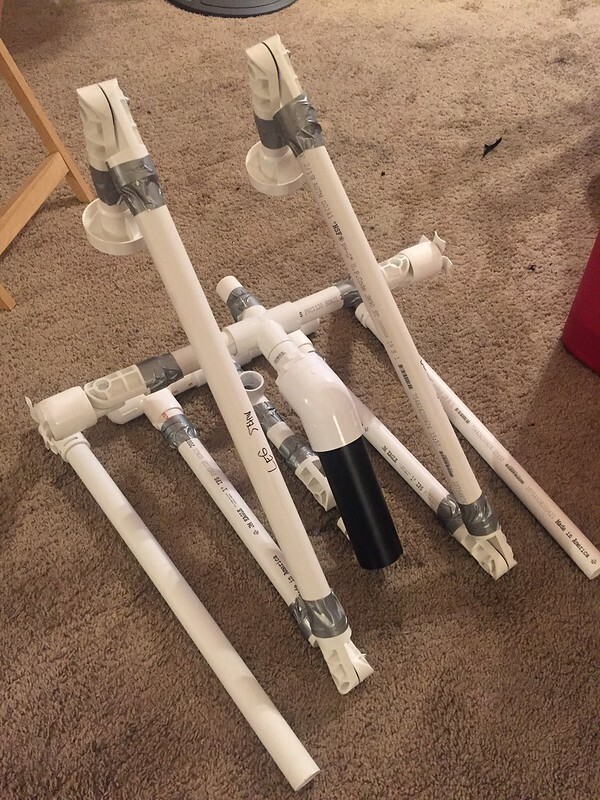 The next step will be mocking up both legs in cardboard, if that test is successful there is no turning back. Now I just want to know what K-2SO sounds like. Alan has described him sounding like an old human, very honest and stubborn. I think I can portray that. 143 Days until the Rogue One Premier! mmhnc, dejordzta and Blue Leader like this. looking forward to some updates...subscribed! Wow this is gonna be awesome! Love seeing droid builds....especially wearable ones! Thank you for the encouragement. I'll be posting another update tonight. I can't wait to see this develop, love costumes that get puppet controls. After a long autumn, I've taken the K-2S0 project in a new direction. Instead of a wearable suit he will be a puppet suspended in front of me as I wear my Imperial Officer uniform. 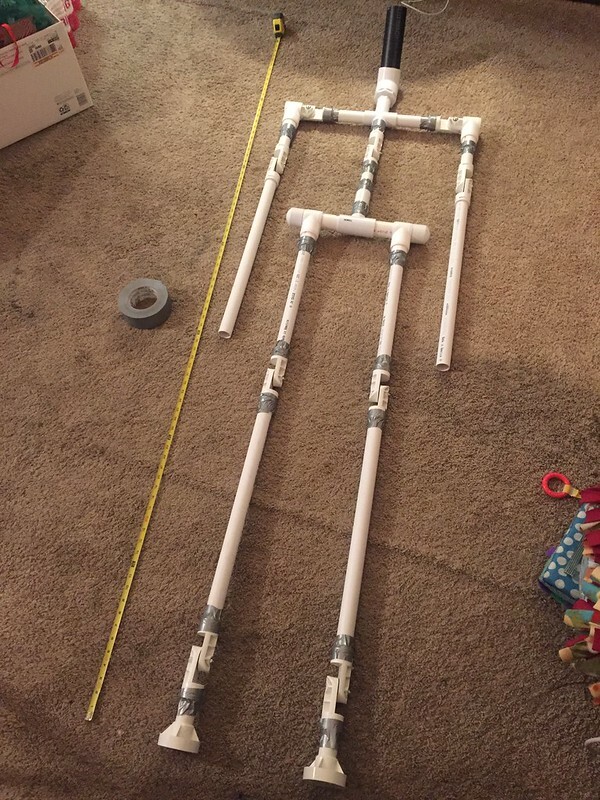 I've cut the PVC to length for his skeleton. The joints are spider-joints from http://www.spiderhillpropworks.com/Single-Spine-Body-Hardware-Kit_p_19.html They sell a whole kit for a Halloween mannequin display with all of the joints you need. I pulled many of my dimensions right off of the K-2S0 black series figure. Making a 1"=1' scale ruler with "inch" marks. For scale, the shoulder cross-bar stands 6' off the ground when he is upright. I added 1-1/2" neoprene washers into the joints so I could move them with friction. These covered the locking teeth in the joints. Next step will be to complete the feet and torso mount. I want to complete a lot of testing while he is just bones, before covering him in EVA foam. 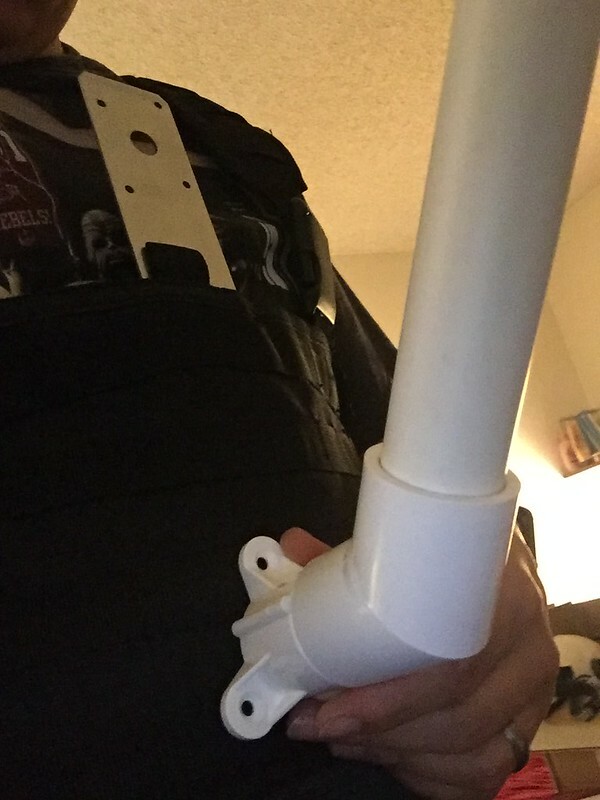 I purchased a tactical OPS chest harness to support the puppet weight under my officers uniform. I plan to post much more frequently here on the RPF as I continue this build. smoothrat and mmhnc like this. What?! Two posts in two days? What is this madness? 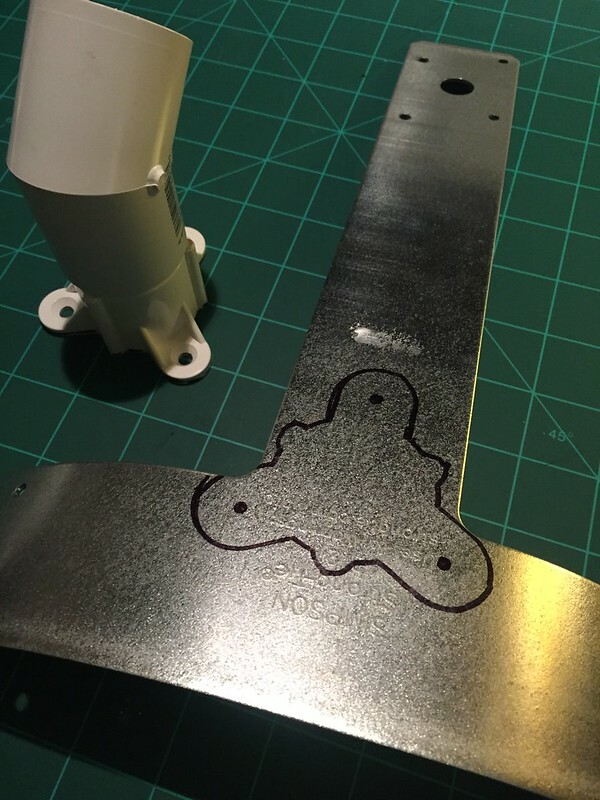 Well progress is moving swiftly on the K-2S0 puppet. 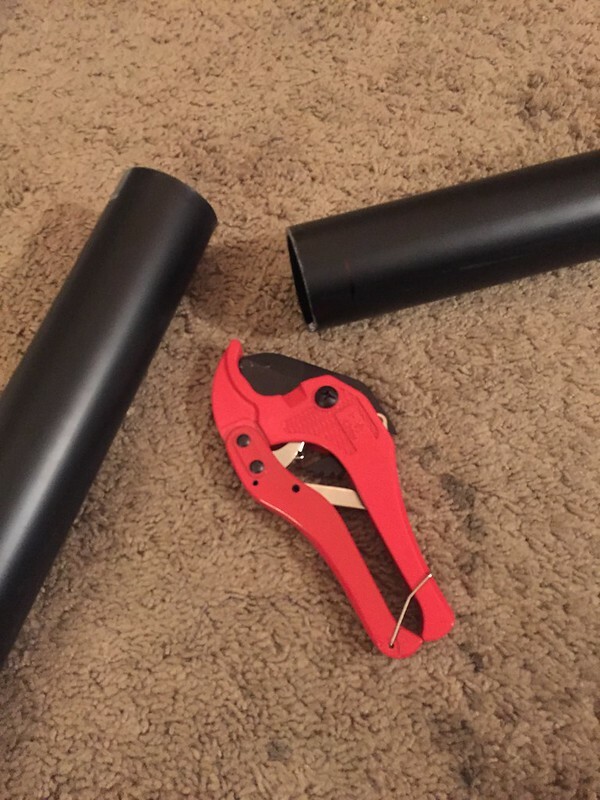 I made another run to Lowes during my lunch break and picked up some needed PVC couplers. I got a new T for the hips. It is 1-1/4" on the long edge and 1" on the middle edge so it fits my existing 1" pipe but holds the full hip pieces so I have less reductions to do. The hip slip rings are 1-1/4". Old and new. These end caps will reach the edges of his hips at 15" across. I may cheat them out a little more but the easy thing is I just need to add longer hip PVC, easy enough if needed. 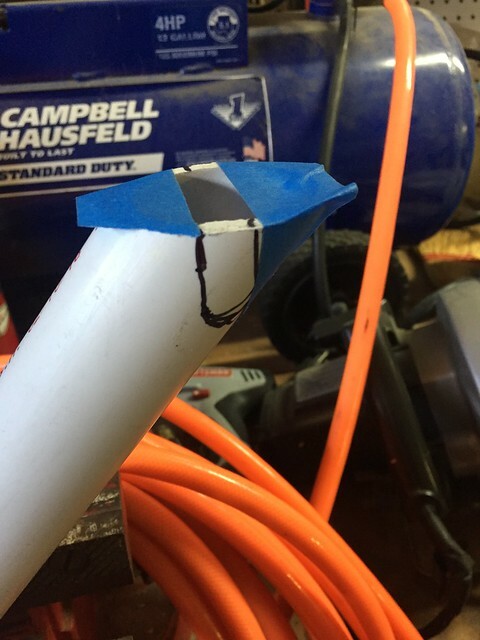 Cut through 2" pipe with my pipe cutter, who says it can only handle 42mm! Adapted the 1" cross bar to a 2" 45* coupler for the neck. This pipe will join with the pan/tilt head at the base of his head. 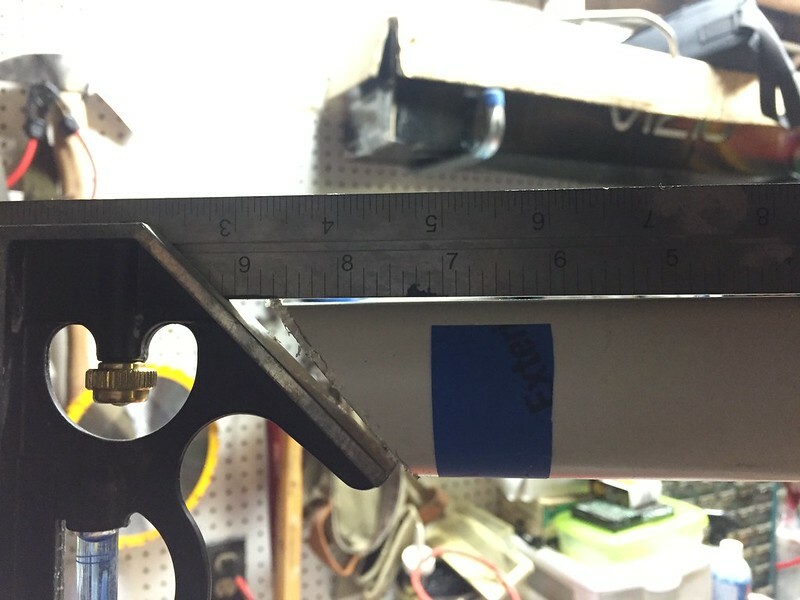 Cut some more 1-1/4" pipe to reduce the slip rings down to the 1" skeleton pieces. All of these joints are friction and tape held for now. WIll glue and screw them together when the dimensions are finalized. i kept the original lower spine. Fully assembled and very tall. Just over 7'. Also note that the fore arms are longer than where his wrists are. The pipe extends to where his fingers will start. More detail on the center connections. Right now the spine joint is locked with it's teeth. I sat him up to see the harness conneciton spot. This is a temporary hold to keep the shoulder slip rings on while I do testing. I will use a long screw to secure a flat plate over this end cap to keep the slip ring in place. That's right! K-2S0 folds up for easy storage. For now. Here is some scale. I stand at 6'. The bend in his neck is exactly 6' 3" off the ground. Testing standing in puppeteering position. The harness connection will happen at the top of my chest. He is VERY tall! My right hand is where the elbow puppet handles will be. My left hand is just supporting his weight for now. 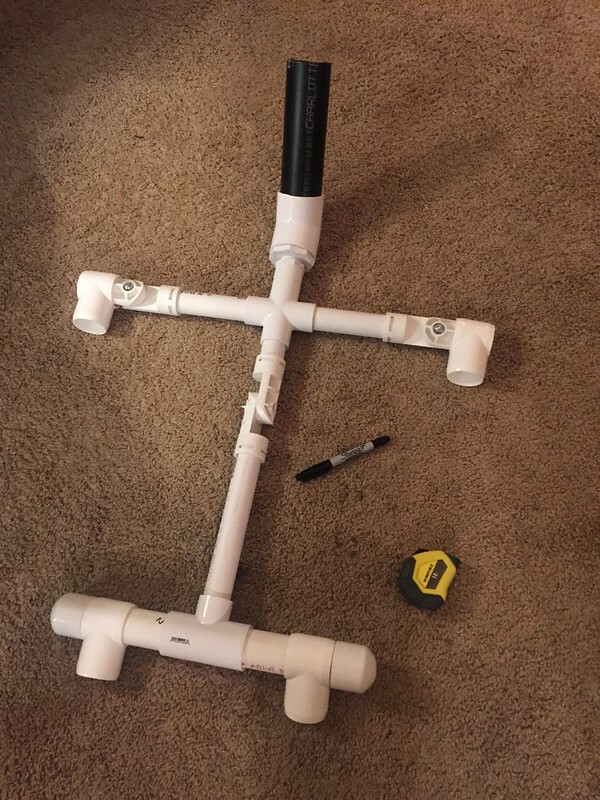 Next step is to still figure out the harness connection and rigidity. Complete the feet and their attachments to my boots. I also need to design how he will come apart for transport. Thank you everyone for your encouragement. I can't wait to see him on screen this Thursday! zyates87 and smoothrat like this. My time table is to be done by the premieres in mid December. 170 days from this posting. Movie opens in 3 1/2 hours here. How's it coming? Just kidding. Keep at it! Ha. Yeah won't make it by the premier. But can still troop around with him and take him to cons. I'm noting who has other RO characters in my area. Sith4Life and Sith Lord like this. Another day, another run to Home Depot for parts. Instead of using a 6" x 15" plywood piece for the main chest support I went with this 12" T plate. I curved it around my stomach and placed it inside the velcro pouch that makes up the front of the military harness. A flange with a 45* coupler will be bolted to this section of the support. I plan to attach webbing or another strong (non stretching) material to the top of the "T" to my shoulder clips. This will hold the T close to my chest and keep it steady as K-2SO tries to pull me over. 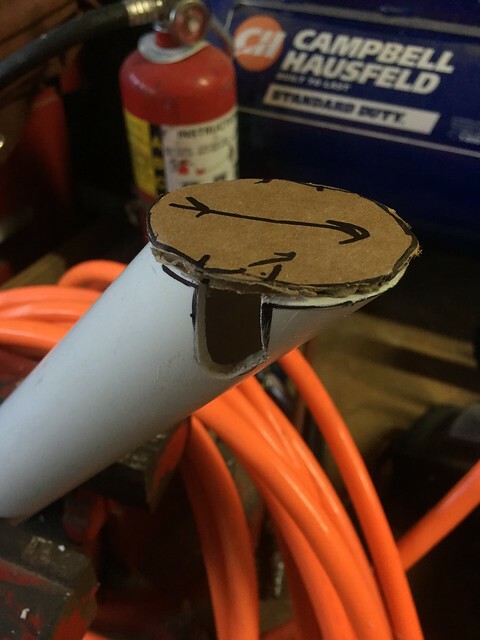 Marked and drilled 3/16" holes for the connecting bolts. I need something that will sit flush on the inside against my chest but not stick out too much into my costume. 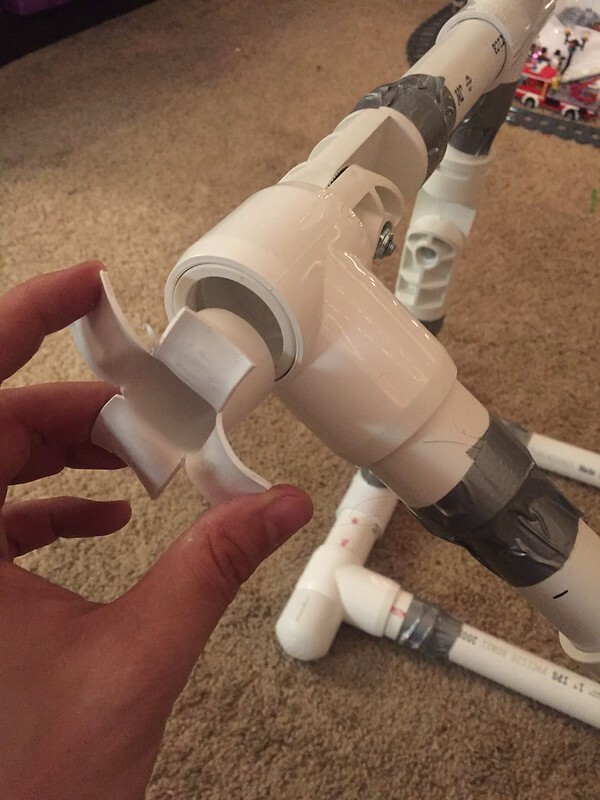 I'm moving the spine spider joint and replacing it with a solid 1" PVC pipe. The spider joint now replaces the top 45* connector. This will let me adjust the angle using the joint teeth when I am all suited up. 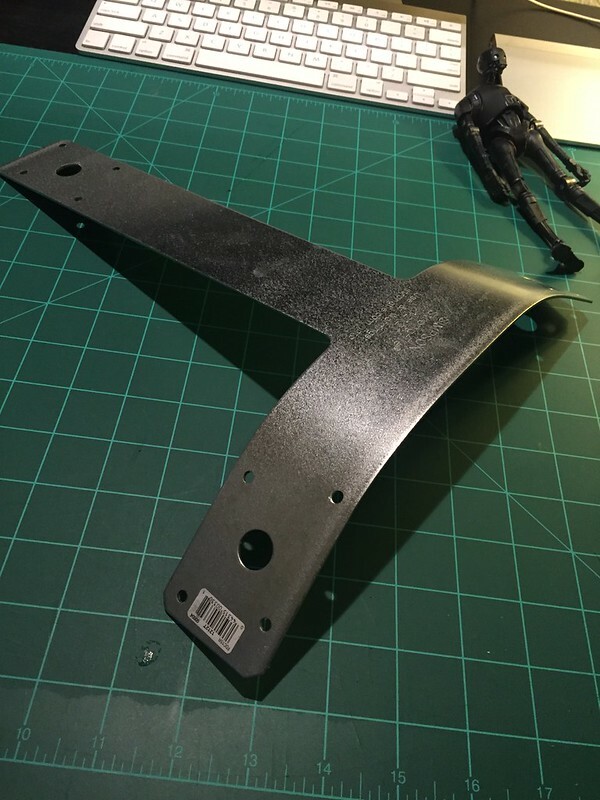 I have a feeling this will help set K-2SO's spine to be level once he is connected. I think I need to invest in a dedicated 7/16th hex driver. I will be adjusting these spider joints several times while making K-2SO and while suited up. I reworked the neck to change it from a 2" pipe to a 1-1/4" pipe. This placed the 45* connector closer to the top chest brace. I like the thickness of this pipe better as I can add strips to it to create the droid detail in his neck. I need to chop the end at a 45* cut to mount the pan/tilt unit. 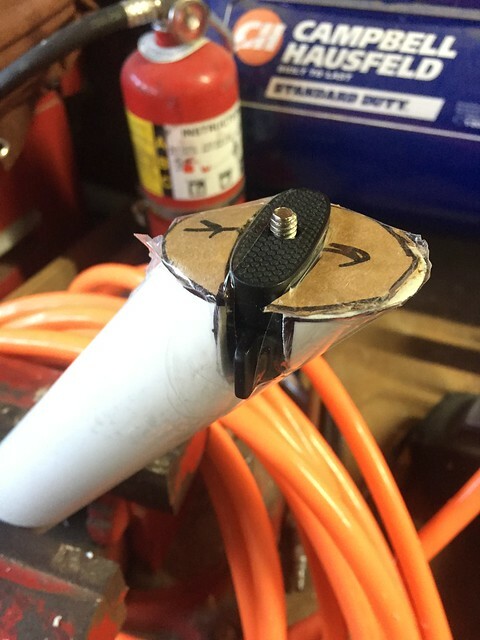 Fortunately this has a standard tripod mounting thread on the bottom that I can imbed a male bolt into the pvc to make a strong connection. The last thing I did tonight was added some small bungee cords to the knees. The goal is to make let the leg return to a upright position easier. I still need to put a piece of plastic in to keep the knee from bending backward. 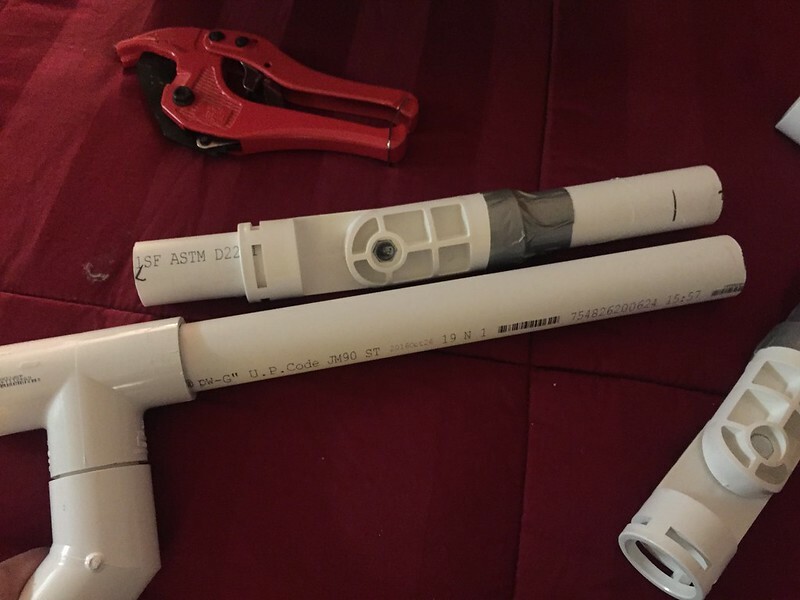 I also need to remember to situate the spider joints with the adjust nut on the outside edge before glueing/* them to the pvc pipe. 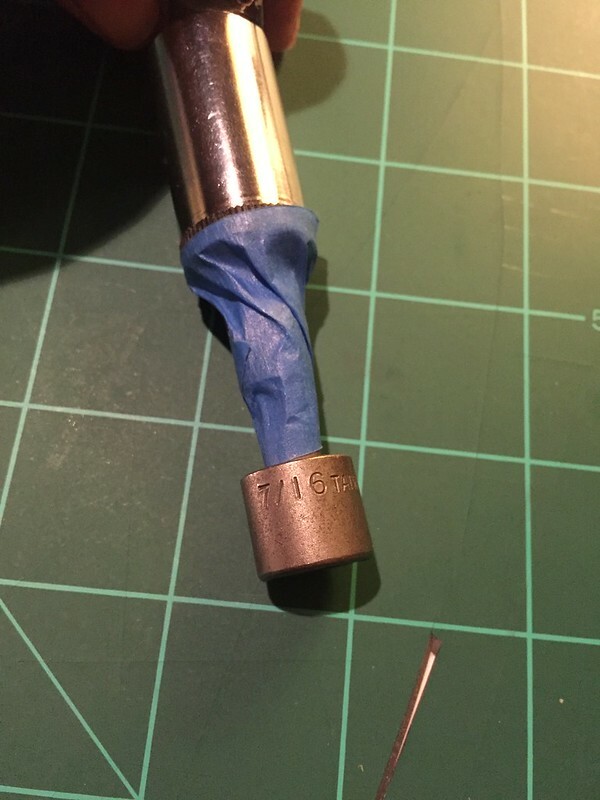 I plan to add several "adjustment' ports for my 7/16th inch hex driver. 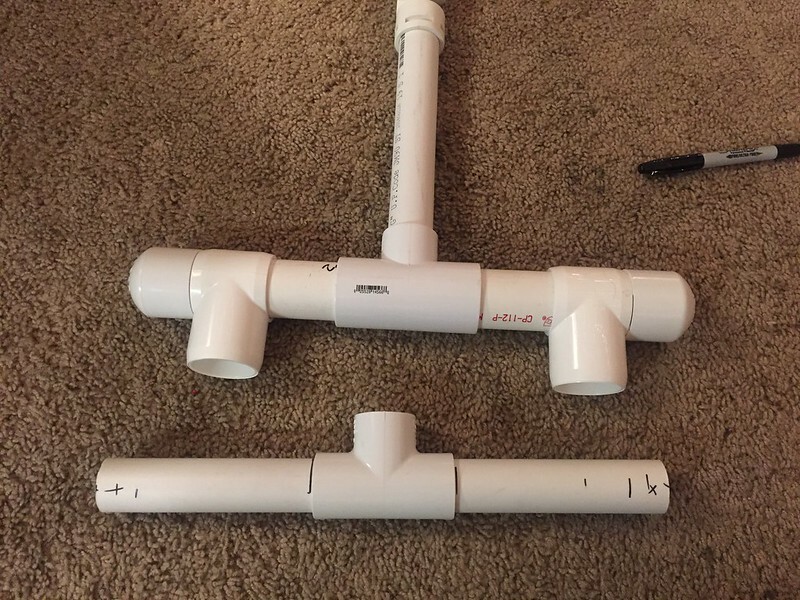 If I can get a hold of my father-in-laws chop saw I may be able to cut some of the pvc the way I need it tomorrow. Sure wish I had a full shop with a band saw. 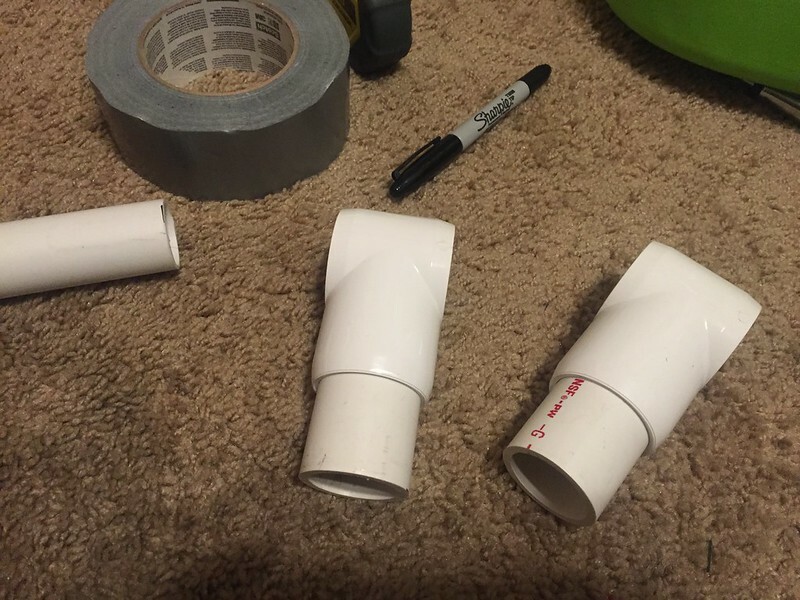 After Christmas I plan to order all of the foam form TNT cosplay. Got a hold of a fine toothed hack saw and vice grip. 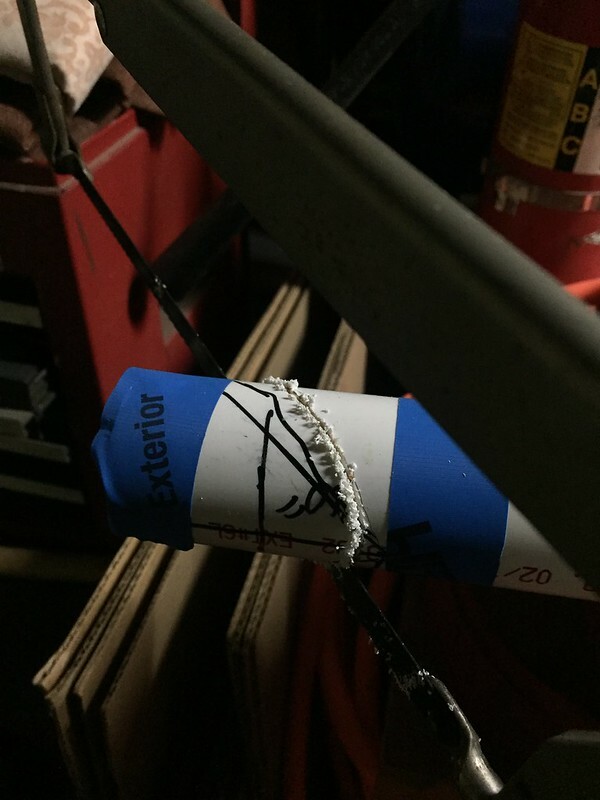 This let me cut the 45* angle on the neck pipe. 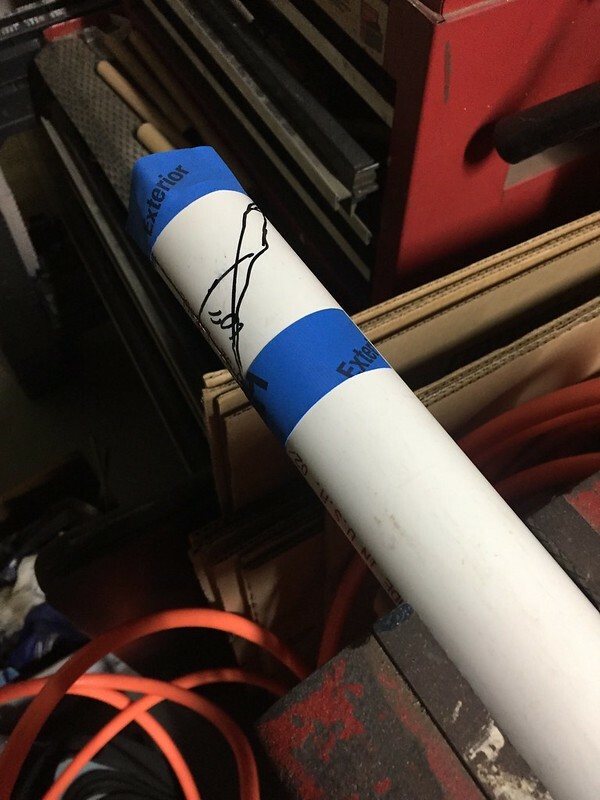 I marked the edges of the cut with blue tape, still eyeballing the angle. The hacksaw made quick work of the cut. Temporarily taped the pan/tilt head to the neck pipe. I can trim it shorter if needed but keeping lots of pieces temp taped for now. 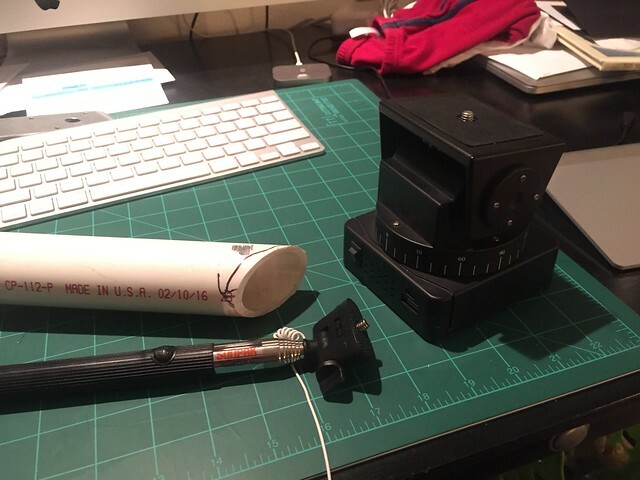 I'll use the tripod thread to secure the pan/tilt once I buy the bolt. Did a photoshop mockup of the top torso pieces with my black series K-2SO overlaid. There is a little distortion from the picture and distances but it's pretty spot on. I may need to drop the base of the neck to overlay the shoulder cross piece and extend the biceps longer to keep the shoulder swivel in the proper place. The pan/tilt is shown where I plan on keeping it. Inside the head giving the skull a central pivot point. Since I don't plan on the wrists pivoting I have the forearm extending into them for stability. The finger control wires will come out of the arm shaft to articulate a grip motion. Can't wait to work on the next piece. n0regret5, zyates87, karmajay and 3 others like this. This is amazing! I don't know if you've seen this but Hot Toys now has the K-2SO figure up and had a ton of photos including the back! How did I miss this project?! This is awesome! I did see. Will use these images for color scheme. As the black series isn't as detailed. Merry Christmas to you all. I've been pouring over the Rogue One Visual Dictionary which has some great shots of K-2SO. I also had a chance to finish the neck mount. 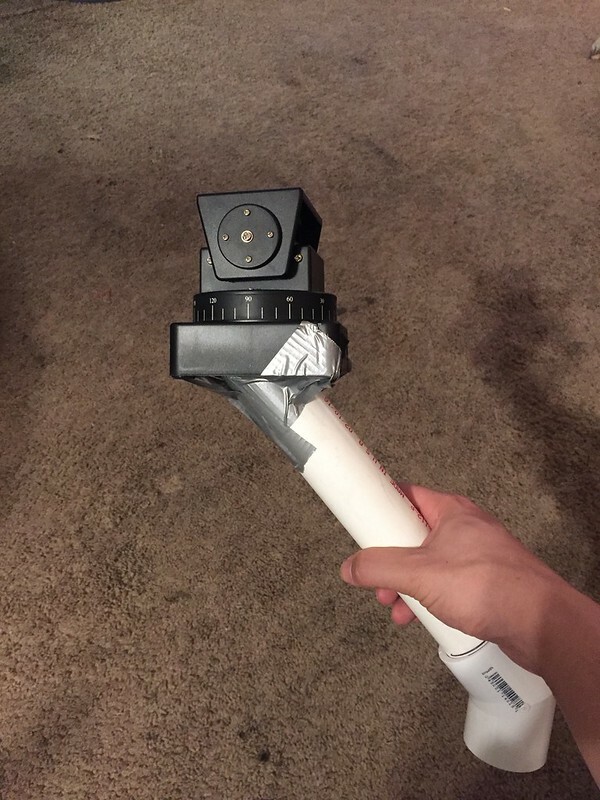 While doing some last minute shopping I found a $4 selfie-stick which had an adjustable camera thread on top. This had everything I wanted in a selfie-stick! 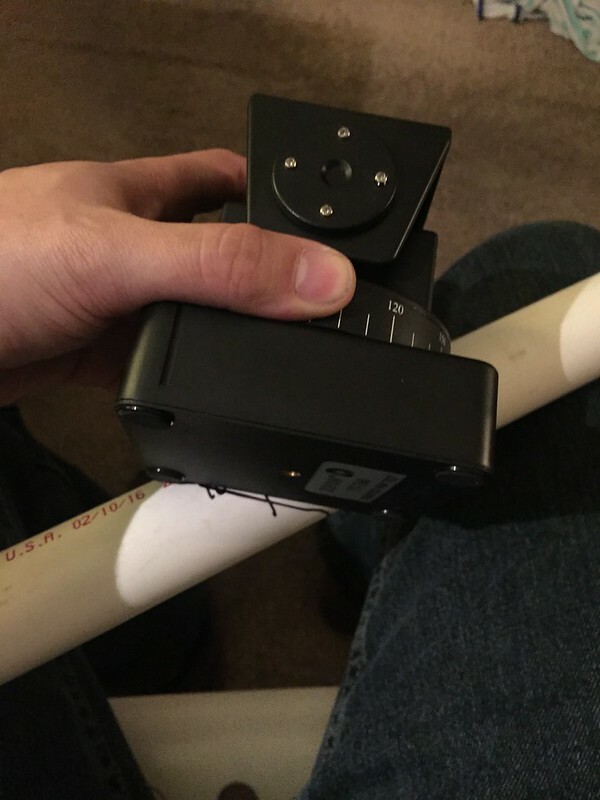 I could use the arm of the stick to secure it in place and the camera thread would securely hold the pan/tilt head to the neck. Measured the selfie head onto the 45* cut I made a few days ago. Used a hack saw and a big bit to cut out the sides. Made a little cardboard filler piece. The selfie head fit nice and snug in the pvc pipe. The cardboard again is just filler. Placed some clear pacing tape over it all. The secured pan/tilt head. 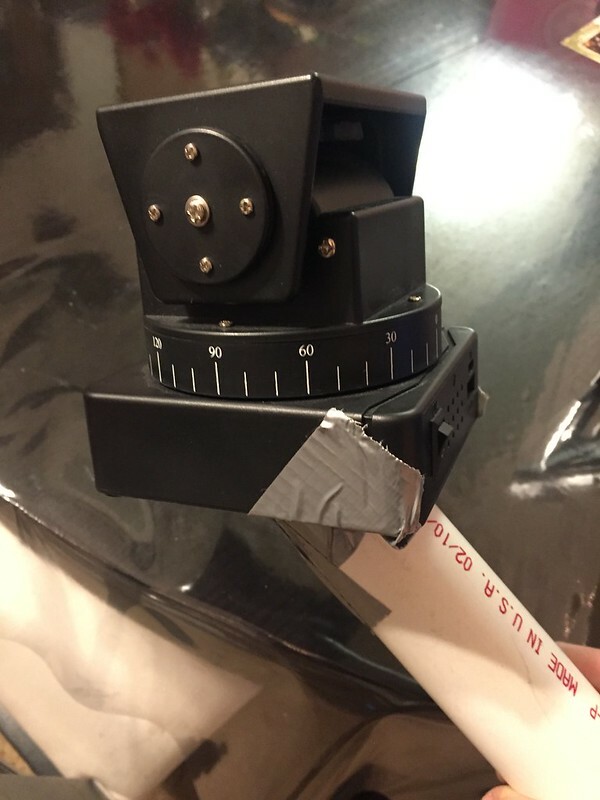 I fortunately can twist it on without having to hold the locking wheel on the selfie head, as that is now inaccessible. 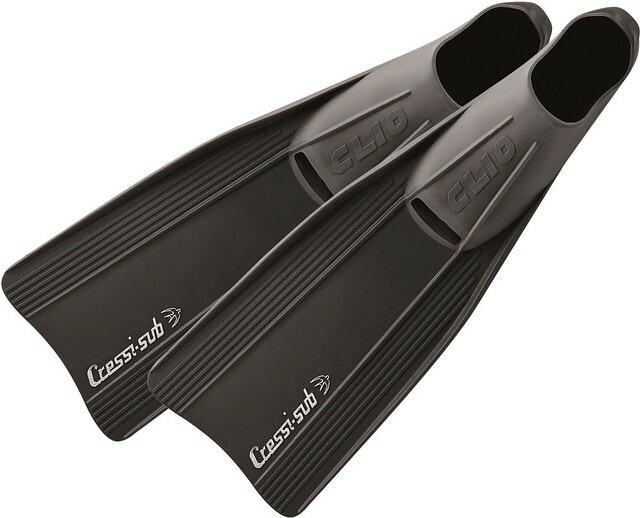 I've also ordered my diving fins for the feet connections. These should fit over my Imperial Officer boots. I plan to cut them into a sort of "S" pattern, mirrored to place K-2SO's feet farther apart than my own. 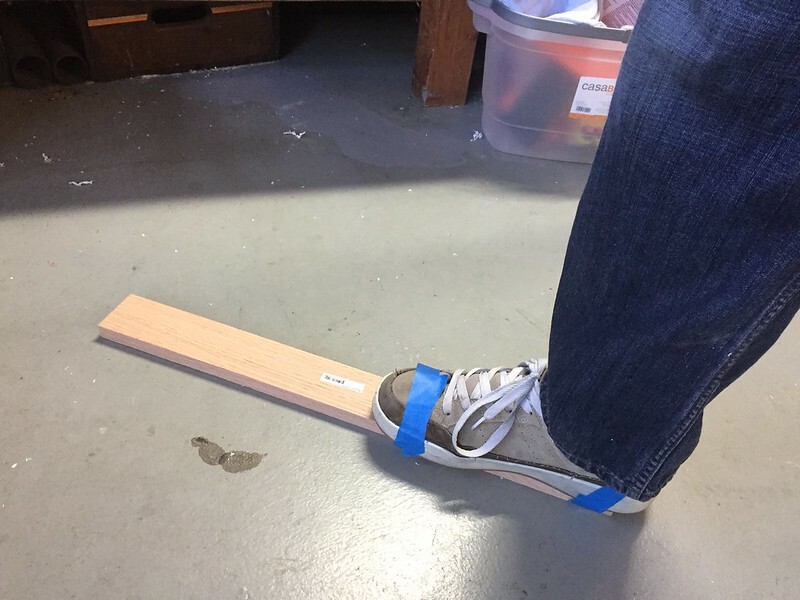 I practiced walking with an elongated foot with a simple board taped to my shoe. I will need to definitely practice a lot to have a more natural gait. But having a robot walk will help. I just need to go slow. I am happy with the progress so far and soon will have all the pieces needed to mount the skeleton for walking trials. I want to get very comfortable with this step before adding any skin. I've also thought more about the joints and i'm for sure including the ankle joint. It will be needed more when one leg is placed ahead of the other. And I will need to reverse the knee mini bungee cords. I want that joint to pull into a bent configuration naturally. So when I take a steep his knee raises up with little effort. Also, I post a little more frequently on my instagram account. @drscifiprops Then compile those shots into updates here. More to design, and I still need to place my big foam order.